Professional Grade Material: Made of high quality 68% nylon and 32% spandex. Lightweight, breathable and adjustable comfort fit with 4-way elasticated stretch that won't roll, slide or slip down, enhance circulation & oxygenation of the blood thereby increasing muscle performance & accelerate recovery of injured muscles, joints & much more. Pain Relief & Promotes Muscle/Joint Recovery: Compression is proven to Promote muscle recovery and injury prevention, our knee sleeve relieves muscle stiffness, extra soreness and offers rejuvenating relief from arthritis, osteoporosis, tendonitis, pain & discomfort, allowing you to perform at your peak in all situations. Adjustable Unique Bidirectional Support: Dual adjustment elastic straps provide customized fit and compression for all day comfort. 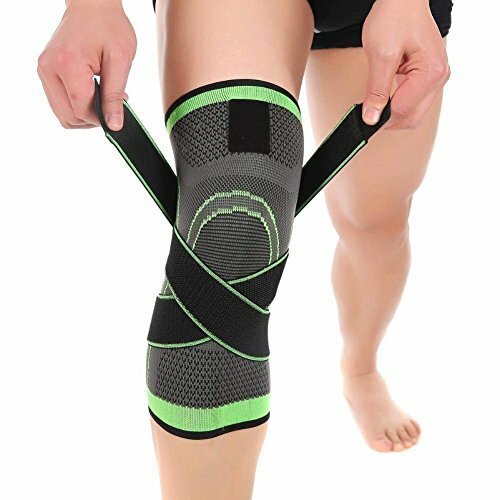 Suitable for Any Sports: Our knee brace delivers targeted compression with moderate support for knees.The best knee support sleeve and knee stabilizer for running, athletics, jogging, cycling, weightlifting, squats, soccer, basketball, volleyball, skiing, tennis, golf, walking, hiking, lifting and yoga, just about any sports and exercise activity! PERFORMANCE GUARANTEED-Designed to protect knees, promote faster recovery, and improve muscular endurance. Our goal is to ensure our knee pain relief products support you on your fitness journey, keeping you on your feet for longer. So, if our knee brace support doesn't fit, just let us know and we'll send you the right size, free of charge. Likewise, if for any reason our product isn't what you're looking for, we'll provide you a full refund, no questions asked!